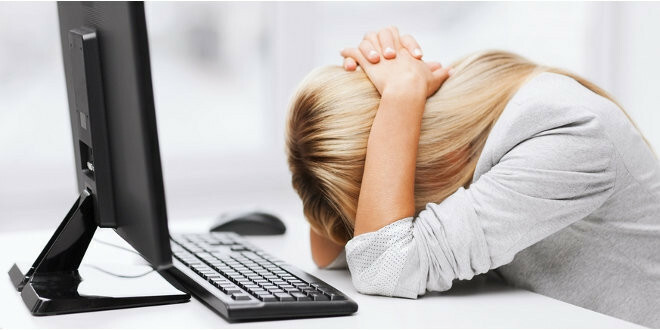 Home » Health » Stressed Out At Work? We live in uncertain times. No one can deny that major changes are taking place on this planet. Every day, we hear about climate-related disasters around the world. Financial, economic and other infrastructures that were so familiar to us are eroding and crumbling away. In the workplace, more and more people are losing their jobs. Others are asked to take on extra work to pick up slack from vacant positions. As workloads increase, individuals are forced to cope with stress, anxiety, job dissatisfaction and chronic diseases. We still believe in the paradigm of scarcity “There is not enough to go around” or “you have to fight for your fair share”. We have to constantly prove that we are more intelligent, competent and capable to get projects, promotions or raises. The fear of scarcity is at the foundation of every human being. It’s in our genes! It is the Ego’s way to disconnect us from the truth. The truth is that we’re all interconnected: human beings, plants, animals and minerals. We have an inner intelligence in the form of vital energy, which permeates our bodies and all living things on Earth. Scientists have discovered that what they thought was empty space in the human cell is not empty at all, but it vibrates with pure energy. As human beings, we hold inside of us the Ego energy – experienced as emotions, and the Love energy – felt as unconditional love within one’s heart. When confronted by a situation, we have the free will of living in the negativity of the emotion or changing the pattern to live in joy. The choice is ours! Understand that this intelligent energy that gives you life is the same energy that gives life to others. So, technically, there is no “Me” and “You” but only “Oneness”. When someone disagrees with you at your workplace or you feel that you are wrongly treated, don’t be mad or hurt for an hour, a day or a month; instead, apply the “One Minute and a Half” rule. Some scientific studies have shown that when you’re angry, your body prepares you for a “fight or flight” response mechanism by releasing stress hormones, such as adrenaline. This response mode runs its course and is removed from the body 90 seconds from onset. When your mind continues to dwell on a negative emotion, your body stays in a stressed state that causes your immune system to grow weaker. You need to transform the emotion into something positive using your intention. Acknowledge and live your emotion for one minute and a half. Visualize that you’re placing this emotion in a bubble of golden light, and give it love. Thank your emotion because it’s a part of who you are and it’s helping you grow. Send this bubble of golden light with your emotion to your root chakra, at the base of your body. Visualize that this bubble of light descends to the core of Mother Earth to heal itself. By repeating this exercise, you’re disempowering the emotion so it loses its grip on you. You’re breaking the circle of fear. Eventually, you’ll become unattached from the drama that the Ego wants you to play. We are doing the best we can with what we know. The same intelligent consciousness is within all of us. Live each emotion for one minute and a half. This process liberates you from the emotion and allows the Love energy to expand within you. The Love energy is a place of well-being, peace, and inner strength that gives you back your power! Next Thinking of consulting a homeopath?